We help local communities improve their livelihoods through ecotourism, which provides extra income to the locals and finances the project. During his explorations of the Malay Archipelago, Alfred Russell Wallace, one of the leading evolutionary thinkers of the nineteenth century, was particularly struck with the depauperate, yet distinctive nature of Sulawesi’s (Celebes) fauna. It was home to members of both Asian and Australian faunas. Today, the island of Sulawesi is regarded as the Center of Wallacea, a unique biogeographical zone where endemism (found nowhere else) level of wildlife is incredibly high. The Togean Islands—lie in the central portion of the Gulf of Tomini that separates the northern and eastern peninsulas of Sulawesi—is the home of a number of endemic species, such as macaque (Macaca togeanus), tarsier (Tarsius togeanus), deerpig (Babyrousa togeanensis), monitor lizard (Varanus togeanus), hornbill (Aceros cassidix), and cuscus (Phalanger celebensis / ursinus?). International tourists, however, recognize Togean as a marine paradise, featuring its calm, crystal-clear, blue sea and high marine biodiversity. 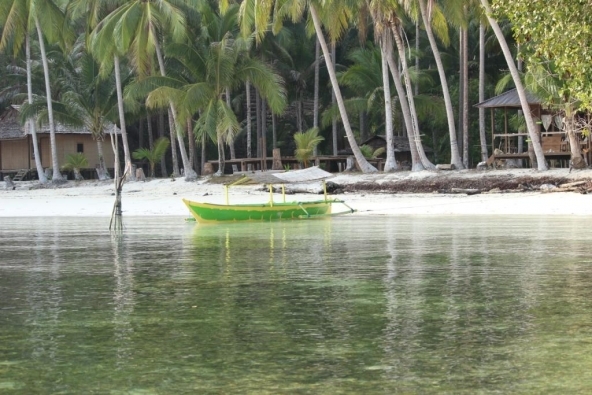 It consists of more than 60 islands and islets, and Malenge Island ranks 7th in size (ca. 1,500 ha). Monsoon forest covers about 75 percent of Malenge Island; the rest is mainly coconut groves and a few patches of mangroves. The forest—growing on nutrient-poor podzolic soils—is characterized by a preponderance of strangler figs, the keystone species—its fruits are the main food resources of various mammals and birds. Malenge is unique for being the only island where macaques (primate) live on, and for its relatively high population density—given the land area of the island—of tarsiers, deerpigs, and hornbills. In addition to hornbills, around 90 species of other birds were identified on the island, which is a very high number for the 1500 ha-island. Could the abundance of the ficus trees attribute to this anomaly? Given its high diversity of birds and small size of the area, Malenge is a paradise for birding, in addition for snorkeling and diving. If they are lucky, the birders will meet macaques, tarsiers, deerpig, cuscus, and–I am not sure about luckiness on the next creature–huge python (up to 7 meter). We have two simple, traditional huts for visitors to stay. They share our meals in our house and can join our activities in the forest, garden, or village of Kadoda. We can take them to any of five clusters of coral-reefs and the sea Nomad islet by our wooden boat. In return, we ask them to give some donation for supporting both the project and our life. Macaca is the most geographically widespread and ecologically diverse of nonhuman primate genera. Eight species in the genus Macaca live endemically on Sulawesi Island; one of them, Macaca togeanus, is found on Malenge Island only. 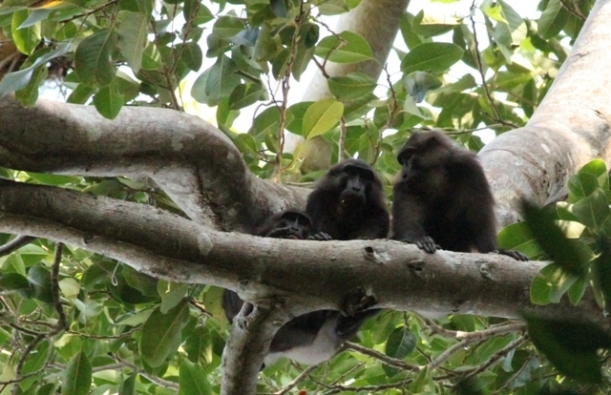 Macaca togeanus live in the forest but forage into the surrounding agricultural areas. The forest of Malenge Island is a part of the National Park of Togean Islands. Because of no ranger patrolling the Park and no law being enforced, the encroachment and illegal logging have rampaged throughout the forest; this situation leads to the rapid habitat loss and degradation. As the result of the decreasing food supply in the forest, the macaques forage more often into the coconut and other cash crop plantations. Deeming them as pests, the farmers kill the macaques anytime and anywhere they see. Because Malenge is small, the habitat loss and degradation and the killings will cost us the extinction of one of our fellow primates soon, unless a preventive act is carried out effectively in time. Tarsiers are primates but they resemble tree frogs more than monkeys. Most conspicuous are their huge eyes and large ears, which tend to give them an unusual appearance but are in fact excellent adaptations to their nocturnal lifestyle; they can rotate their heads 180 degrees, like owls, compensating for the restricted moving range of their huge eyeballs in the sockets. Tarsiers have long spindly fingers and feed on insects or other small animals—the only entirely carnivorous primates, consuming no plant matter whatsoever. 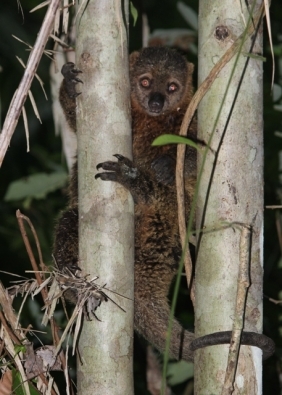 Weighing 150 grams or less and sizing a head-and-body length of about 12cm, they are the smallest primates in Asia. Amazing back jumpers, tarsiers are able to jump horizontally more than 40 times their own body length, more than 5 meters. Nine of 12 species in the world live on the Sulawesi Island; one of them is on the Togeans. All species are threatened due to the habitat loss from rapid deforestation. 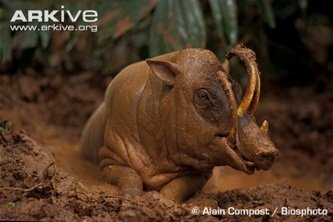 The babirusa (deerpig, Babyrousa spp. )—a deer-like suid whose males display enormous curving tusks that grow through the roof of its mouth and curl back over its eyes—contains three species found only on Sulawesi. Babyrousa togeanensis, one of the species, live on the Togeans, including Malenge. Although they are more active in the evening, I encountered some babirusas—including a female with some piglets—in the forest during the day, but only four times over two years. Two of them were killed by domestic dogs in my neighbor’s garden and the forest behind our home. In the last six months, however, I have never seen any babirusa, an indication of decreased number of its population. Cuscus is a marsupial animal, like kangaroo or koala in Australia. It has a skin pocket for carrying its premature baby. Sulawesi is the western border of the distribution of this Australian type animal. Over two years, I have only seen three adult cuscuses in different trips in the forest; one of them was with a baby on its back. As nobody else has seen them in the same period, I assume the population of cuscus on Malenge is very low. A survey is immediately needed for the strategy on saving them. Indonesia has more than 1700 bird species (ca. 17% of the World’s) and around 480 of them are found on Sulawesi Island (189,000 km2); my home island Malenge has around 90 species (almost 20% of Sulawesi). Given its area is only about 15 km2 (<0.1% of Sulawesi), the biodiversity of the avian fauna on Malenge is extraordinary. One of the impressive birds on Malenge is hornbill. Comparing with the other four target species, its chance of survival is much greater. I hear their loud calls behind my home every day and I always see them anytime I explore the forest. 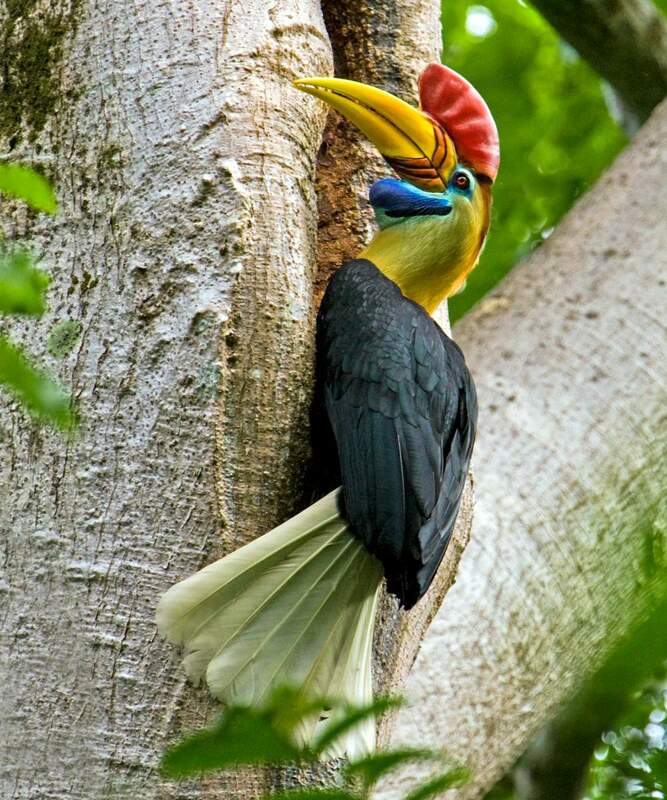 The knobbed hornbill (Aceros cassidix) is an endemic bird of Sulawesi. The knob of the male bird is red and larger than the yellow knob of the female’s. Not only it is the largest bird—bigger than rooster—in the forest, the hornbill is the loudest as well; unless I listen carefully, I cannot differentiate its call from the macaque’s. When the flock—up to 15 per group—flies together, their hoarse call concert breaks the serenity of the forest and their flapping wings create a hurricane-like sound over the canopies.